I went a week or so ago to the inaugural Oxford Wine Festival (www.Oxfordwinefestival.org). Among a range of interesting stands (and an excellent bar with some fascinating wines run by 1855 – www.1855oxford.com) I came across the range of Lambrusco wines imported by Kilgariff & Kahan and could not resist the opportunity write about red fizz for once. Lambrusco is one of those wines that, rather like Beaujolais Nouveau, lost itself to easy drinking marketing in the 1970s and 1980s and has been painfully trying to regain lost ground ever since. Cheap and sweetish red fizz was the definition of Lambrusco in both the US and the UK (thanks to distributors Riunite). Now nobody would argue that Lambrusco is a classic wine but what most people have forgotten (if they ever knew) is that Lambrusco is a fabulous wine with strong flavoured foods – as well as an excellent aperitif. 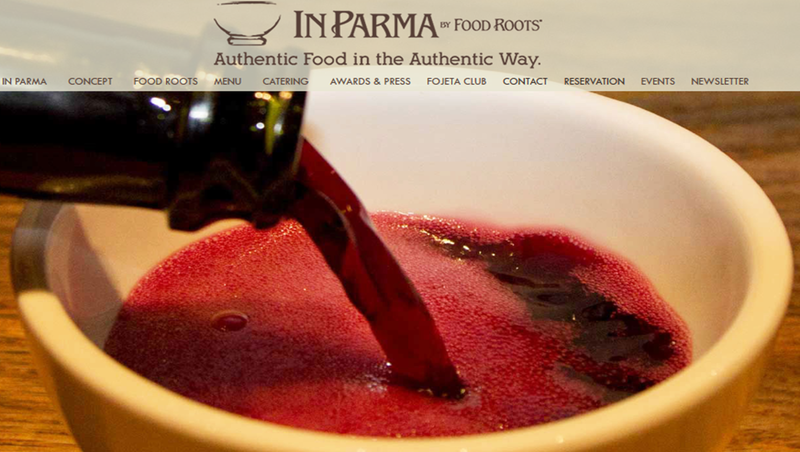 If you need convincing of that and you’re in or around London then head to ‘In Parma by Food Roots’ (www.in-parma.com). This tiny Italian restaurant in Charlotte Place (close to Goodge St. tube) gets rave Trip Advisor reviews. It serves only high quality products from small producers located around Parma in Northern Italy. One of these is Lambrusco wine – deep purple red in colour, dry and satisfyingly earthy in taste, lightly sparkling in the mouth but with an abundant purple mousse. It comes only in white porcelain bowls – the local name is fojeta – and it’s well worth a trip to London or a check on K&K’s website. The word Lambrusco essentially means ‘wild grape’ and like a number of grapes that go back to ancient wild vines it’s evolved and multiplied over the centuries, splitting into many different versions. For details I’ll direct you to Wikipedia (if you’re in a hurry) or (if you want the real deal) to Jancis Robinson, Julia Harding and José Vouillamoz’s great Wine Grapes. This is now in ebook form at half the price of the weighty original – for details see www.jancisrobinson.com/articles/wine-grapes-ebook-launched or www.winegrapes.org). The reputation of Lambrusco was ruined in the 1970s by producers who used the tank (or Charmat) method for fast fermentation in bulk producing that sweetish, red liquid with no taste and no presence. Pink Babycham perhaps… Some small tank fermented wines such as those of Lini 910 and Fattoria Moretto turn out just fine but the best use metodo ancestrale or metodo classico which means there’s a secondary fermentation in bottle on the lees for a year or more. K&K’s ‘Lini 910’ (which refers to the producer’s 1910 foundation) is just such a wine. Made with Lambrusco Salamino grapes (and yes it does mean that the shape of the bunches resembles a sausage) this is a terroir wine that will work wonders when you next have a plate of affetati misti (or plain old cured meats). Do try it – the ancient Romans rated it and so should we. The Lini 910 In Correggio Lambrusco Scuro was a dark ruby red with blackberry and violet on the nose and very decent length in a pleasant and somewhat velvety finish. The same producer’s Labrusca Rosso had a tinge of purple to the eye, plenty of red fruit and savoury, almost tannic finish. This entry was posted in What I've been drinking and tagged Lambrusco, Oxford Wine Festival. Bookmark the permalink.